This is my first post here. 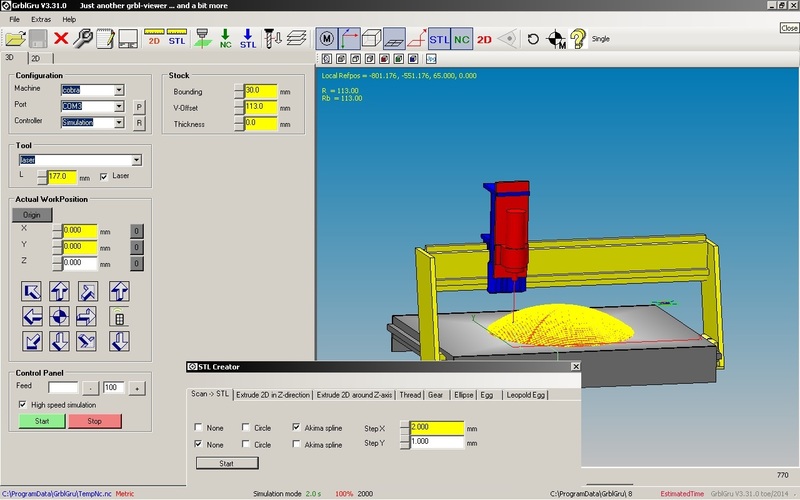 I’ve developed a little CAM program with 3 dimensional virtual machine simulation of the whole machine with all axes. This allows you to check all movements before you start your machine. The name of the program is GrblGru, or short GG. You can also use it to direct control an Arduino with GRBL system as well as a TinyG with a 4th axis. GG is a ‘one man show’. Finding software solutions for CNC questions is my hobby, and I can spend time for it only after my normal work. So, of course GG is not so professional like Easel. I’m very impressed from all actions, good ideas, examples, that inventables provides every day. But maybe also GG can give you some suggestion or a new idea for your work with your CNC machine. For example there are some DXF templates for making spur gears or boxes, which can be interesting for you. Also you can see on youtube: https://www.youtube.com/channel/UC4_AHkEVDWNWW61ZW4qBHWA some of my projects. So, of course GG is not so professional like Easel. Maybe you are right, but maybe it’s only that I don’t want to be a loudmouth. Just try it and form your own opinion. If you search, you will see that I have promoted you here on the inventables Forum. @GerryKaslowski As for not being professional, it means it is done by a hobbyist and not by a big company. You’ll find it just as if not more useful than Easel at times. The OP is just being modest. Thank you for your kind words to my first post here. I’m very happy to present again another machine. It’s a machine with only 2 rotation axes. The well-known and famous ‘EggBot’. The little machine to draw on spherical or egg-shaped objects. Thanks to my friend from Switzerland, who had the great idea for the EggBot simulation in GrblGru. I’ve also changed the format of the machine- and settings data. Unfortunately this makes it necessary to make a new full installation. So, please answer the question in the setup dialog ‘Delete old version’ with YES. If you have made your own textfiles, macros or machine models, please make a copy before. 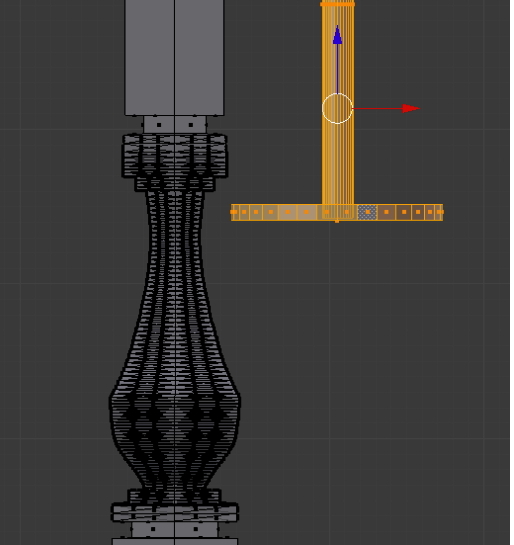 how you can use this new 3D model to simulate the drawing process of your EggBot. I would like to introduce you again a new version of my program. This time I was engaged with the production of balustrades for historical ship modeling. The extremely small dimensions (e.g., 4x4x12mm) and nature of these tiny wooden posts necessitate special machining. In the video https://www.youtube.com/watch?v=B0jZ2XsUGLY&feature=youtu.be I’ve tried to describe the process of machining the balusters with a little circular saw. the new version, availlable at https://goo.gl/quFpdZ, provides a new 3D model of a very nice lathe. It’s a near 60 years old UNIMAT lathe, updated to a CNC machine by a friend from Austria. In the attached video I’ve documented how to create the toolpath and the G-code from an DXF or SVG drawing. This time I tried to provide a ‘trial version’ for GrblGru starters. For this purpose, a menu appears at the start of the program in which you can select the basic purpose. In addition to the full version, a simple 3D simulation and a G-code sender are available. So if you want to try GrblGru, I especially recommend the 3D simulation mode, which allows with little effort to simulate existing G-codes files. I also added new 3D models again. Among other things, a laser. Next time I will report separately about it. Because I’ve been often asked to describe what GrblGru actually is, I’ve created also a document, which attempt to fulfill this request. Are you not interested in making this into a larger open source project? What programming language did you use to develop this? What 3rd party packages did you use? I am a programmer myself, and I am interested in CNC lathes…which is a niche group inside a niche group it seems so there are very few resources I can find on designing the CAM, simulation, and G-Code support(sending). Where does one start? At the moment, I’m not planning to make the program into an open source project. GrblGru is written in c# and almost everything of it is ‘hand’ made by myself. That’s because I’ve also found no useable packages. So, sorry that I can’t give you any better information. At https://goo.gl/quFpdZ you can download my new GrblGru version V3.27.0 for free, if you like. This time I have dealt with the Grbl Laser mode. Unfortunately I have to admit that I don’t own a laser yet, but I will buy one as soon as possible, because the application possibilities are already great. Because I do not yet have any practical experience myself, a friend helped me to work out the necessary program adaptations for the operation of a laser. As always, I tried to briefly describe the essentials in the attached video. Since my friend use his laser to make cosplay costumes, the main focus is on the steps involved in cutting materials. A short request at the end. Even a small weak laser can cause irreparable damage to the eyes. Be sure to get laser safety glasses and be aware of the necessary safety regulations. Lately I’ve been approached on 5-axis machines. Although I know that there are still a few construction sites open in my 2D program, I was tempted to take my first steps in the direction of 5 axes. 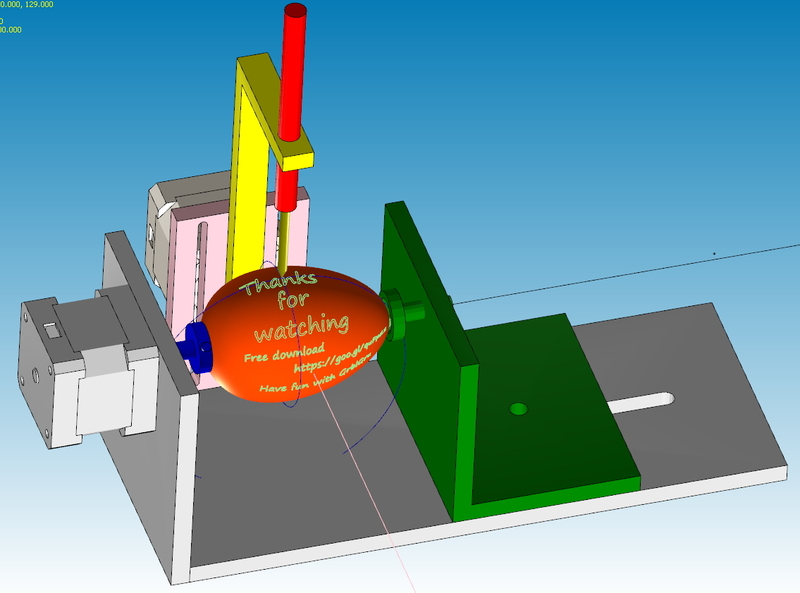 For this purpose, I have added a rotary and a swivel axis to the 3D model of my machine on a trial basis. Of course, the functionality is still very limited. Corresponding CAM functionality will also be a long time in coming. But, you can already move all 5 axes of the model manually and simple G-code is already processed by the interpreter. The whole thing is suitable for thinking about 5-axis technology and its complexity. For all those who are interested in this topic, I have put a small guide for importing own 3D-models on my dropbox. Suggestions and ideas for design a practical and cost-effective 5-axis machine for the hobby area are most welcome. As a suitable controller I have chosen an Arduino Due (approx. 50 Euro) with the operating system g2core. My controller and motors are not yet connected, but the data exchange with g2core looks very promising. In the attached video I once recorded my current status on this topic. I’ve changed a lot. Therefore you have to answer the question about deleting the folder with ‘YES’ during the installation, so that a complete reinstallation takes place. I’ll give it a shot once I get home! Most of the changes concern the lathe operation. The coordinate system has been adapted to the standardized XZ system.Creating jobs now works in the same way as when milling. Now also templates for turning chamfers and radii have been added. Suggestions for other useful templates are welcome. 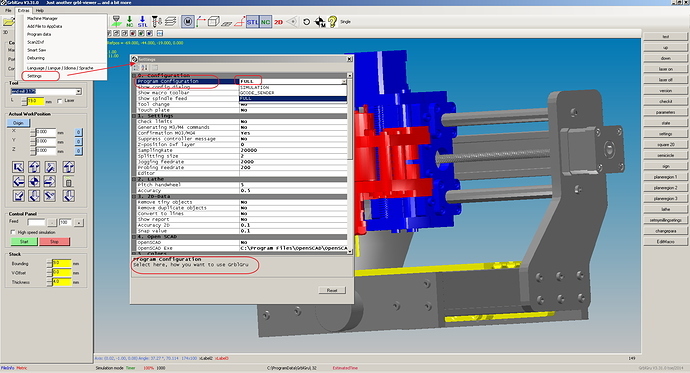 When milling, internal geometry data can now also be exported as SVG and G-Code can be imported as data. I also started to include OpenSCAD. since some time I have the wish to be able to cut threads on my CNC lathe. Since the costs for a regulated drive of the main motor and the necessary control would exceed my hobby budget, I tried to mount a stepper motor parallel to the main motor. In normal turning mode the stepper motor is dismounted, in extended mode the main motor is switched off and the stepper motor makes the work. The whole thing is controlled by a cheap Arduino Uno and GRBL. Since it is first of all only a test, I have carried out the assembly of the motor according to the “Quick & Dirty” method. The result was nevertheless quite encouraging. Since the stepper motor does not have the power of the main motor, I made some adjustments to the program. Further functions are to follow. In addition to threading the possibilities of the controlled rotary axis are enormous. Particularly in connection with a small grinding device the following things are quite conceivable: Worm grinding, sharpening drills, grinding turning steels … etc. Maybe someone would like to upgrade his lathe as well. I would be happy to receive tips and suggestions for further applications. The video shows the current status as usual. Thank you for trying GrblGru. Your description sounds like you haven’t selected the Full-Mode. Please check the “program configuration” in the settings.